Investor can invest in emerging markets sector through ETF (exchange traded fund), mutual fund, stock, bond, and CEF (closed end fund). 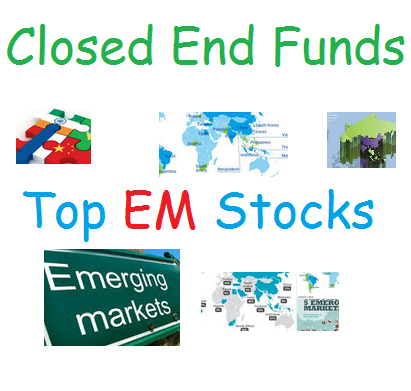 This article will look into the emerging markets stock closed end fund investment especially the best performing funds. The emerging markets CEFs focus its investment in companies located in emerging markets region. These countries are Brazil, India, China, Turkey, South Africa, etc. Typically, the funds have higher growth rate than the developed countries fund such as US or European. The top performing list is sorted based on its 1 year performance (up to 02/25/2015). You can find the fund review, performance, expense ratio, dividend yield, fund’s NAV, management, leverage, fund’s sponsor, premium/discount info, etc. This Turkish Investment Fund invests mainly in stocks of Turkish companies. It has total net assets of $59 million. The current expense ratio fee is 1.28%. The fund sponsor is Morgan Stanley Investment Management Inc. The current dividend yield is 2.64%. As the top performing emerging markets stock fund, this Turkish Investment Fund has returned 8.28% over the past 1 year, and 3.34% over the past 5 year. This fund has 24 holdings in its portfolio. Top 5 stocks are Turkiye Garanti Bankasi A.S., Turkcell Iletisim Hizmetleri AS, Turkiye Halk Bankasi A.S., Anadolu Efes Brewery ve Malt Sanayi A.S., and Ulker Biskuvi Sana. The Aberdeen Emerging Markets Smaller Company Opportunities Fund utilizes its assets to purchase stocks of emerging market smaller company issuers. With total net assets of $144 million, it has dividend yield of 1.62%. The current expense fee is 1.64%. This fund is a non-leveraged fund. In 2015, this emerging markets stock fund has returned 1.22%. It has a 3 year average return of 1.96%. Top 3 countries are Brazil, India, and South Africa. Top 3 sectors are financials, consumer staples, and industrials. Top 5 stocks are Central North Airport Group, Parque Arauco SA Parauco, Jaya Jusco Stores Berhad, Clicks Group Limited, and Cimsa Cimento Sanayi Ve Ticaret A.S. This Templeton Emerging Markets Fund objective is to provide capital growth through investment in emerging markets equities. It has $316 million of assets. The fund is introduced to investors in 1987. The fund manager is Dr Mark Mobius. Its expense fee is 1.34% per year.